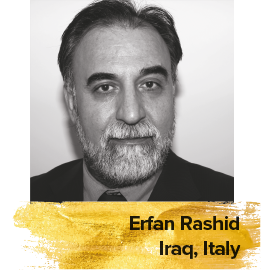 Based in Italy, Iraqi journalist, director and festival veteran Erfan Rashid graduated from Baghdad’s Academy of Fine Arts in 1976. He has been the Artistic Director of the Mare di Cinema Arabo Festival in the Sicilian city of Messina and also Director of the Arab Programme at the Dubai International Film Festival. He is a film critic and correspondent from Italy for the pan-Arabic London-based daily Al Hayat and the coordinator of the Arabic section at Italian news agency AGI. As a filmmaker, he has made documentary films in English, Arabic and Italian.